Boot Ranch, the exclusive private club community in the Texas Hill Country, has named Alex Rhyne as its head golf professional. 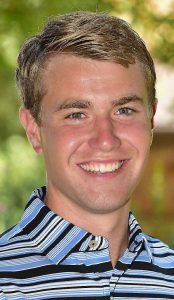 Rhyne, 24, joined the Boot Ranch team in March 2017 after graduating from Campbell University in Buies Creek, N.C., where he received a Bachelor’s degree in Business Administration and became a PGA Class A member through the school’s Professional Golf Management program. During college Rhyne served internships at three golf clubs that included a six-month position at the prestigious Wade Hampton Golf Club in Cashiers, N.C.
Rhyne began at Boot Ranch as assistant golf professional and quickly moved up the ranks, ultimately succeeding former head golf professional Emil Hale who became general manager at Boot Ranch last year. “I look forward to continuing the high service standards and member programs we have established and creating fresh concepts for golf events and activities that will bring together all of our members and their families,” Rhyne said. A native of Stony Point, N.C., Rhyne and wife Savannah – who he met in fifth grade – live in Fredericksburg with their infant son. For more information visit www.BootRanch.com or call (830) 997-6200.